Kick off your visit on the 3rd (Mon): admire the natural beauty at Hallett Nature Sanctuary and then take a stroll through Times Square. 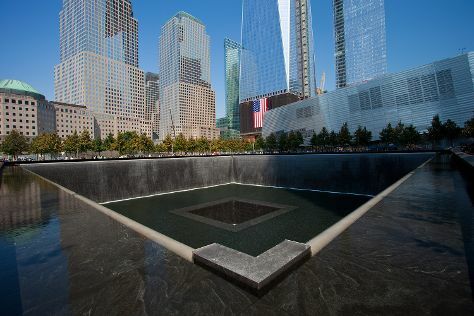 Get ready for a full day of sightseeing on the next day: appreciate the history behind 9/11 Memorial and then take in the pleasant sights at Central Park. To see more things to do, reviews, traveler tips, and other tourist information, refer to the New York City trip planner. Manchester, UK to New York City is an approximately 11-hour flight. You can also do a combination of flight and bus. The time zone changes from Greenwich Mean Time to Eastern Standard Time, which is usually a -5 hour difference. Plan for a bit warmer temperatures traveling from Manchester in June, with highs in New York City at 31°C and lows at 21°C. Wrap up your sightseeing on the 5th (Wed) early enough to travel back home. Blue Mountain Lake is a rural hamlet in the Town of Indian Lake of Hamilton County, New York at the intersection of New York Routes 28 and 30. On the 6th (Thu), look for all kinds of wild species at Adirondack Experience, The Museum on Blue Mountain Lake, take in the dramatic scenery at Buttermilk Falls, and then appreciate the extensive heritage of Northville-Lake Placid Trail. For photos, traveler tips, and more tourist information, you can read our Blue Mountain Lake online day trip planner . Traveling by car from New York City to Blue Mountain Lake takes 4.5 hours. Alternatively, you can fly. Traveling from New York City in June, expect Blue Mountain Lake to be slightly colder, temps between 25°C and 9°C. Finish your sightseeing early on the 6th (Thu) so you can travel to Niagara Falls. Start off your visit on the 7th (Fri): admire the striking features of Frank Lloyd Wright's Darwin D. Martin House Complex, explore the fascinating underground world of Cave of the Winds, then enjoy breathtaking views from Niagara Falls Observation Tower, and finally take in the dramatic scenery at Niagara Falls. Get ready for a full day of sightseeing on the 8th (Sat): contemplate in the serene atmosphere at Our Lady of Victory Basilica, stroll the grounds of Forest Lawn, and then try your luck at Seneca Niagara Casino. Drive from Blue Mountain Lake to Niagara Falls in 5 hours. Alternatively, you can fly. Plan for somewhat warmer temperatures traveling from Blue Mountain Lake in June, with highs in Niagara Falls at 29°C and lows at 17°C. Cap off your sightseeing on the 8th (Sat) early enough to travel back home.